One of the secrets of the CFF™ system: When you contract the muscles as you slide over the skin you are toning the muscles in the process. You are NOT stretching the skin. As the skin lifts up with the tighter, smoother muscle, the wrinkles also become less deep. Grasp with a wide-open, hand, under the chin. Tilt the chin towards the ceiling feeling the stretch in your neck Slide your open hand down to your collarbone and Hold, while counting to ten. Repeat 5 times. Place your thumb pads, one in front of the other, resting under the chin, fingers resting against the jawbone. As you press the tongue against the roof of the mouth, press and slide your thumbs, alternately, from front (directly under the chin) to back (to where the under chin meets the neck), making a rhythm of one thumb slide for every tongue press. Repeat 40 times. 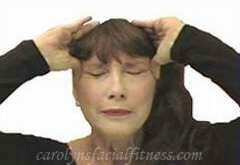 Push up with the index finger, just under the brow, while closing the eye and stretching the upper eyelid down. Hold for ten and repeat 5 times. Place the Index finger from each hand in both corners of the mouth. While pulling the corners of your mouth down with your fingers, draw your lower lip into a pout and hold for a count of 5. You may also feel a strong pull in the neck. Repeat 10 times. “Jowl Lifter” – Lifts Your Jowls! Place your fingertips just below the jawline. Tilt the head back, curling the bottom lip over the top lip. Turning your head, tighten the cheek muscles and squeeze the eye shut while gently but firmly sliding the fingertips up over the jawline towards the outside corner of the mouth, ending there. Repeat 5 times on each side.